It is hard to turn on the radio without hearing that this is “the most wonderful time of the year.” In reality, it is not the season to be jolly for upwards of 50% of our greater Rhode Island Jewish community. 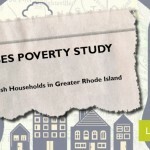 The recently released study “Living on the Edge” conducted by Brandeis (insert link) starkly reveals the shocking economic plight experienced by all too many of our community members. In its role as facilitator, the Alliance wishes to continue the dialogue and garner community participation. Thus, I invite each of you to attend the Living on the Edge Town Hall Meeting at 7pm on Thursday, January 16, which shall be held in the Social Hall at the Dwares JCC. This discussion will be led by Fern Chertok, lead researcher of the Brandeis study. I am heart-warmed to report that we have already secured $1 million dollars out of a needed $1.8 million dollars to fund our initial three year emergency campaign to both buttress existing social service programs and create new responses to help those who are vulnerable. However, money alone will not do the trick. I am making a call to action to individuals of all ages: give of your time and your talent. The Alliance is looking for roughly 125 volunteers who can provide an hour or two each month, in areas as diverse as legal and financial counseling, resume writing, personal shopping, transportation, friendly visitation, reading and literacy, and medical and dental care. I believe volunteerism is the glue that will hold us together and create solutions for greater Jewish Rhode Island. Contributing your time, energy and gemilut hasadim (acts of love and kindness) is at the core of our Jewish values. To volunteer, please contact our Community Concierge Wendy Joering at 401.421.4111 ext. 169.